Inspired by the colors and design aesthetic of the roaring 20's, this necklace is (as they would have said back in the day) darb! 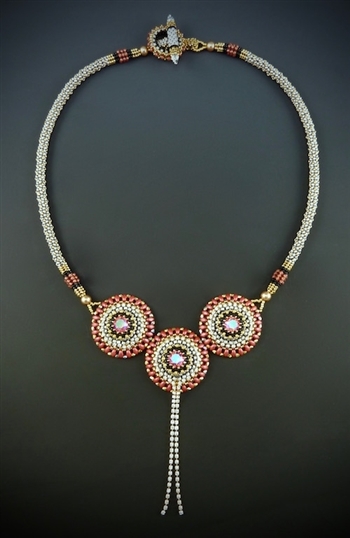 Named for the popular prohibition era cocktail that sported its pinky color, this necklace utilizes innovative bezeling techniques and combination stitching to create the fabulous circular components that comprise the centerpiece. The beautiful rhinestone chain is made from incredibly delicate cubic zirconia stones that are only 1.5mm in diameter! Made with beauteous precious metal seed beads this is definitely one not to be missed! Techniques include right-angle weave, peyote stitch, herringbone, and chenille.